On Tuesday July 1st, 2014 TeenSHARP had the privilege of hosting 25 African leaders, in residence at the University of Delaware (UD), who were selected as part of President Obama’s Young African Leaders Initiative (YALI). Overall, there were 500 YALI fellows representing 49 African countries being hosted at 20 different universities across the United States. The 25 fellows visiting TeenSHARP represented 19 different countries including: Burundi, Cameroon, Comoros, Côte d’Ivoire, Democratic Republic of Congo, Ethiopia, Kenya, Lesotho, Mauritius, Nigeria, Rwanda, Senegal, Sierra Leone, Somalia, South Africa, The Kingdom of Swaziland, Uganda, Zambia, and Zimbabwe. As many of the UD YALI fellows are engaged in youth activism and leadership development work in their respective countries, TeenSHARP was selected for a site visit during the fellows’ 6-week institute at UD. As a TeenSHARP alumna, I joined a group of other TeenSHARP alumni, students, parents, and staff in planning and facilitating the fellows’ visit to Rutgers-Camden to learn more about TeenSHARP’s work. After over 3 hours of dialogue, interactive exercises, and idea-exchange I left the event incredibly inspired. The fellows each demonstrated a strong, intrinsic motivation to change the world and a strong faith that they will be successful. TeenSHARP is an official certifying organization for the President’s Volunteer Service Awards program. This allows us to acknowledge our volunteers with this prestigious national award after they complete a certain number of volunteer hours. See www.presidentialserviceawards.gov for more details. Highly-interactive bi-monthly training sessions are a major component of TeenSHARP. These sessions engage youth in team-building activities, experiential learning exercises, break-out discussions, reflection and planning, and leadership skills practice. Individuals who are passionate about working with teens and encouraging high-achievement are invited to apply to serve on TeenSHARP’s session support team. The support team will work with the teens during TeenSHARP sessions and assist the program facilitators in making each session a success. TeenSHARP engages in regular academic consultations with its participants and in the process learns of the many needs of our youth and their families. Through our discussions with teens and their families and review of participants’ report cards and progress reports, it is clear that many of the youth served through the program could benefit from regular tutoring sessions. TeenSHARP invites qualified individuals to serve as tutors in math, reading, foreign languages, and other subjects for its participants either once per week or 2-3 times per week. TeenSHARP has opportunities for qualified volunteers to lead projects tailored to their interests and availability. The project leader positions with TeenSHARP allow volunteers to gain valuable project management experience while also impacting the families and communities served by TeenSHARP. 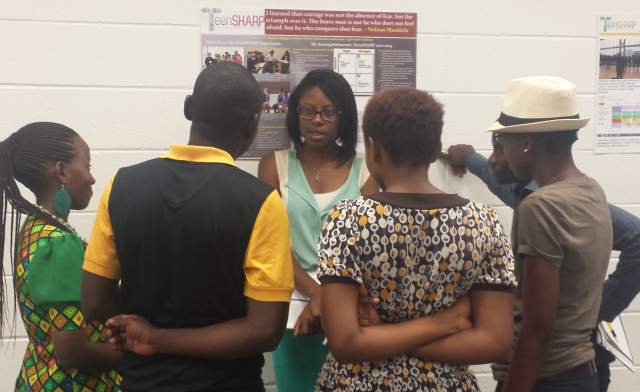 TeenSHARP is looking for qualified undergraduate or graduate student volunteers to serve as college prep mentors for TeenSHARP high school students. The college prep mentors will receive training and will then be paired with one high school student each to provide them with college prep advising and hold them accountable for their college prep action plan. If you would like to apply for a volunteer position with TeenSHARP, share any ideas about how you can help, or make a donation to the program; please contact us at teensharp@gmail.com or 609.505.4285.